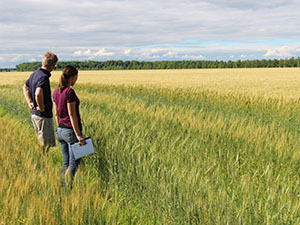 Michelle Carkner, PPB project coordinator, and Loic Dewavrin, participating farmer, looking at Loic's wheat plots near Les Cedres, Quebec in 2016. Participatory plant breeding (PPB) aims to restore the place of farmers in crop variety development by bringing together farmers, plant breeders and other partners in the plant breeding process. This form of plant breeding is particularly successful in crop production systems that are underserved by traditional breeding programs and for systems where unique growing environments are encountered. As a result of the relatively small number of organic acres, plant breeding programs have generally overlooked organic crop production systems, and crop varieties currently used in organic agriculture are bred for conventional, high-input production. The objective of the University of Manitoba's PPB program is to develop cultivars relevant to farmers needs by conducting selection in the farm environment. A second aim important to our PPB program is to give farmers more control over seed resources by helping them develop and maintain their own varieties. The University of Manitoba based PPB project is entering its 5th year in 2015 and has received funding from The Bauta Family Initiative on Canadian Seed Security and the Growing Forward 2 program of Agriculture and Agri-Food Canada. This funding will help to build capacity of the PPB program and increase the skills and knowledge of the farmers and research participants. The major strengths of this program are having farmers guide the breeding objectives and providing farmers the opportunity to have more control over their seeds. For more information on the PPB program contact Michelle Carkner, participatory plant breeding project coordinator, at (204) 474-6236 or email michelle.carkner@umanitoba.ca. How does a PPB program work? This page created January 2015.